On November 9, 2017 at The House of Blues in Boston, MA, over 400 financial executives and their guests gathered to Send Cancer Packing. The evening showcased the importance of both individuals and companies supporting the cause, and how together we can one-day send cancer on a permanent vacation as we work to see a day when all cancers have a cure. 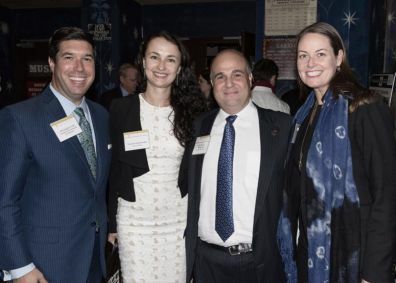 With support led by Foundation Sponsors BNY Mellon, Eagle Investment Systems, and ICE Data Services, guests were able to travel the world, alternating between a tropical side and a winter lodge side at the House of Blues. While enjoying a Dark n’ Stormy by Goslings, sampling a tasting by Brewer’s Fork and Select Oyster Bar, and swaying to music by Duppy Conquerors and Real Steel, guests networked with old friends, new colleagues, and industry peers. Through the generous support of Exclusive Resorts this year’s Grand Prize Drawing featured a four-night vacation in one of the Exclusive Resorts' three to five bedroom private residences, some able to accommodate up to ten. The winner got to choose from 8 destinations. After an exciting live auction and tremendous support from the crowd, Executive Director Frank Heavey took the stage to remind everyone the importance of the funds being raised at the event. He shared the story of Leslie Duffy and her battle with non-small cell lung cancer. The drug Tagrisso, developed by the doctors at Dana Farber Cancer Institute and the Robert and Renée Belfer Center for Applied Cancer Science, saved Leslie’s life. But unfortunately, Leslie’s cancer returned and has mutated, the Tagrisso no longer works. The support from the night’s event will help Dana Farber and the Belfer Center develop new solutions. The generosity of the crowd was on full display as guest texted in pledges to help Expect Miracles Foundation reach their goal of raising $20,000 in donations. Not only did we exceed, our goal – we doubled it – raising over $40,000. Thank you to everyone for the support! Founder and Chairman Frank Strauss came to the stage to thank the Miracle Maker Leadership Council and welcome Assistant Director Maggie Dombroski to present the Kanley Cup to the Young Professionals group from the city, Boston or New York, that was able to raise the most money this year. Congratulations to the Boston for being this year’s winner! The evening culminated with Frank Strauss presenting a check for $825,000 to Dana-Farber Cancer Institute in support of the Robert and Renée Belfer Center for Applied Cancer Science. Strauss shared, "In addition to the check presented this evening, Expect Miracles Foundation will award a total of over $1,000,000 to support cancer research and cancer patient care programs." Thank you to our wonderful guests, sponsors, partners and volunteers – YOU are the Cure. You can check out even more photos on our Facebook Page! We hope to see you at our next event, The 4th Annual Expect Miracles in Manhattan on February 1, 2018 in New York City.